FORS, a leading Russian integrator and software developer, announced a brand new product on the market for the monitoring of the human physical shape, motivating people for the active life style – on-line platform DACADOO health score in Russian language As an exclusive distributor, FORS will provide this solution on the territory of Russia and CIS, focusing on creation of its own partner network. 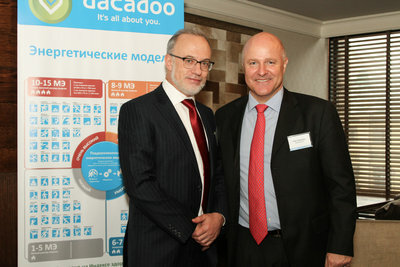 «Our cooperation with DACADOO could be explained by the whole logic of our development and growth. Accumulating the expertise in the fields of healthcare, sports, sports medicine and telemedicine, we were meeting the requests from the professional communities: doctors, sportsmen, trainers and sports managers. Now, having DACADOO in our portfolio, we provide the possibility of the personal control of the state of body for the mass-market consumers, - tells Alexey Golossov, FORS President. — We are ready to apply and develop our vast practical experience in deploying of huge analytical and integration systems, mobile applications for the promotion and popularization of DACADOO idea in various Russian social and business circles». Based on the principle «Quantified Self», DACADOO stimulates responsible position of the human to his health. For that, just one thing has to be done – to create your own account and to input maximum data available on your daily activities, nutrition, sleeping, etc. on the regular basis. The platform will account your personal health score automatically (from 1 – the lowest to 1000 - the highest level) and will be informing about future improvements. DACADOO could use the information from the different external resources - biosensor gadgets like pedometer, weighting-machine, glucometers and so on. The personal health data parameters will load automatically. The platform was designed in cooperation with the leading scientists, professors of the Massachusetts Technological Institute (MIT), Boston, USA on the base of the 72 million human-years clinical observation data on the heart and vessels diseases risks. Created for the B2C and B2B2С market segments, it could be demanded by the corporations and included as a core element into the loyalty and healthcare programs. Being integrated with the corporate HR, BI, CRM- and other systems, DACADOO will enable to get a full picture of the possible correlations between various facts and indicators – as physical shape of the employees, the amount of the accepted sick-lists, personnel flow, productivity per capita and other efficiency markers. Peter Ohnemus, dacadoo AG President, notes: «As the well-being of the people grows, they start to behave more responsibly, trying to protect and strengthen their health. The Russian market was anticipating for such a product, and we are just happy to provide it. Indeed, the personal health score provides a really easy way for the higher level of the social and business culture, making people more happy and satisfied by their life. FORS has all the necessary resources, expertise, drive and experience for the successful launch of the product on the Russian market». Today dozens thousands of users worldwide are able to indicate their personal health score regularly and lift it up day by day, posting and sharing their results with friends in social media, creating groups and receiving on-line experts consultations. The dacadoo Web Platform and applications for Android and iOS are available in Russian since December 2013. More possibilities of the solution could be achieved in the result of its integration with Big Data technologies, especially Oracle Endeca Information Discovery, that would create a powerful instrument for forecasting and visioning, investigating and discovering of the hidden interconnections between factors influencing the quality of life of the humans. Platform DACADOO was officially represented on the press-conference, which held in Moscow in the restaurant Simple Pleasures and drew big interest of the press.